Immunoglobulin-related amyloidosis is a monoclonal plasma cell disorder in which the secreted monoclonal immunoglobulin protein forms insoluble fibrillar deposits in one or more organs. In nearly all cases, the deposits contain immunoglobulin light (L) chains or L-chain fragments, termed L chain–type amyloidosis (AL). In a few reported patients, the amyloid deposits have contained immunoglobulin heavy (H) chains; these are termed H chain–type amyloidosis AH). Before the discovery that the major fibril component in these patients was an immunoglobulin fragment, patients with light chain–type amyloidosis were described as having primary (in the sense of idiopathic) amyloidosis or, when the burden of monoclonal plasma cells was large, myeloma-associated amyloidosis. Immunoglobulin L and H chains are two of 20 different fibril proteins that have been described in human amyloidosis. For a general discussion of the human amyloidoses, the types of human amyloidosis, and an approach to the diagnosis of amyloidosis, see Amyloidosis. L chain–type amyloidosis (AL) is related to both multiple myeloma and monoclonal gammopathy of undetermined significance (MGUS). These monoclonal plasma cell disorders can be categorized according to the total body burden of monoclonal plasma cells. When this burden is large, the diagnostic criteria for multiple myeloma are fulfilled; when this burden is lower, MGUS is diagnosed. Multiple myeloma and MGUS fall on a continuum, with 20% of patients with MGUS progressing to multiple myeloma within 10 years. In most patients with a monoclonal plasma cell disorder, whether multiple myeloma or MGUS, the monoclonal L chain secreted by the clone remains soluble in the bloodstream. However, in some patients, the physicochemical characteristics of the immunoglobulin L chain or L-chain fragment lead to its deposition as amyloid. Thus, some patients with light chain–type amyloidosis meet the diagnostic criteria of multiple myeloma, whereas other patients can be considered as having MGUS in which the clonal immunoglobulin product is amyloidogenic. In addition to cases of monoclonal gammopathy in which the secreted clonal immunoglobulin remains in solution and those in which secreted clonal immunoglobulin forms amyloid deposits, a third group consists of cases in which the monoclonal proteins accumulate in various organs, but the deposits do not form fibrils. Patients with this form are described as having nonamyloid monoclonal immunoglobulin deposition disease (MIDD). The relationship among the plasma cell dyscrasias and the amyloidoses is depicted in the image below. The relationship among light chain–type amyloidosis (AL), the other monoclonal plasma cell disorders, and the other amyloidoses. 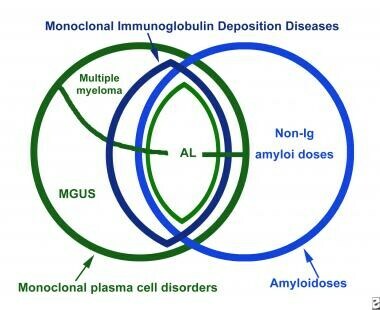 Ig = immunoglobulin; MGUS = monoclonal gammopathy of undetermined significance. The most common light chain–type amyloidosis precursor proteins are L chains of the lambda (l) class. The lambda light chain–type amyloidosis is approximately twice as prevalent as the kappa (k) light chain–type amyloidosis, and L chains of the Vl 6 class are the most amyloidogenic. Clonal plasma cell proliferative diseases in which the Vl 6 gene is expressed are always associated with amyloid deposition. Among Vk genes, the Vk 1 subgroup is overrepresented among amyloid-forming L chains. Within the V region families, certain amino acid residues occurring at particular positions in the L-chain sequence render those chains are more amyloidogenic, with a combination of such residues increasing the chances of a particular L-chain protein being associated with tissue amyloid deposition. Another structural feature that appears to predispose to L chain – type amyloid deposition is enzymatic glycosylation of the L chain. Although 15% of human L chains bear sugar residues, almost one third of amyloidogenic L chains are glycosylated. Why certain amino acid and glycosylation characteristics in L chains predispose to amyloid formation remains unknown. L chain – type amyloid deposits contain intact L chains, L-chain fragments, or both (most patients). The fragments always include the amino terminus of the chain and range in mass from 5000 to 16,000 d. In 90% of patients, the deposited peptides include at least some constant region sequence; therefore, the peptides react with commercially available anti–L chain sera, which are specific for constant region determinants. These observations explain why 10% of deposits do not bind either commercial anti-k or anti-l antisera. L chain – type amyloid deposits can develop in any organ system. The most common organs involved are the kidneys, the heart, the gastrointestinal (GI) tract, the peripheral nerves, and the liver. In most cases, the deposits affect multiple organ systems. Factors leading to the specific pattern of organ involvement in a particular patient are not understood. In a minority of cases, localized amyloid deposits, including amyloid masses (amyloidomas), may be found in various sites, even in the absence of systemic disease. The pathogenesis of localized light chain–type amyloidosis is not well understood, but a small, localized clone of plasma cells apparently produces immunoglobulin, which forms deposits near the site of synthesis. In some patients, plasma cells have been demonstrated histologically, accompanying the localized amyloid deposits. In one patient, DNA sequencing revealed that local plasma cells were producing the locally deposited L chains. Researchers from the University of Arkansas for Medical Sciences (UAMS) studied the gene profile of more than 500 patients treated for multiple myeloma at UAMS. Of the about 25,000 genes in the body, the UAMS team found the expression of just 17 genes revealed which form of the disease the patients had. A gene is expressed when its DNA is transcribed into RNA, which is later transcribed into protein. The expression level of those 17 genes becomes an overpowering and overriding predictor of outcome in therapy. It is questionable whether a drug that targets those genes will be developed. Annually, one to five cases of immunoglobulin-related amyloidosis per 100,000 people occur. The best available direct data on L chain–type amyloidosis prevalence in the United States come from Olmsted County, Minnesota, where the annual prevalence of L chain–type amyloidosis was calculated to be approximately one case per 100,000 people. The population in this location is primarily of northern European ancestry. Whether this prevalence applies to different populations is not known. Based on indirect calculations, the prevalence may be higher. The annual incidence of multiple myeloma is approximately five cases per 100,000 people, and the prevalence of L chain–type amyloidosis in patients with myeloma is approximately 20-35%, producing an overall incidence of combined L chain–type amyloidosis and myeloma of 1-1.5 cases per 100,000 people. Only one in five patients with L chain–type amyloidosis has frank myeloma; therefore, the total number of patients with L chain–type amyloidosis type is five times the number of patients with L chain–type amyloidosis and myeloma, or at least five cases per 100,000 people. Symptoms of immunoglobulin-related amyloidosis reflect the organs containing amyloid deposits. Factors that cause deposits in different organs in different patients are unknown. Cardiac deposition is the most severe consequence of systemic L chain–type amyloidosis, eventually occurring in most patients. Cardiac L chain–type amyloidosis is the cause of death in most patients with systemic L chain–type amyloidosis. L chain–type amyloidosis affects people of all racial and ethnic groups. No data are available comparing the incidence of disease in different groups. The male-to-female incidence ratio of L chain–type amyloidosis is 2:1. Shaughnessy JD Jr, Zhan F, Burington BE, Huang Y, Colla S, Hanamura I, et al. A validated gene expression model of high-risk multiple myeloma is defined by deregulated expression of genes mapping to chromosome 1. Blood. 2007 Mar 15. 109(6):2276-84. [Medline]. [Full Text]. Nienhuis HL, Bijzet J, Hazenberg BP. The Prevalence and Management of Systemic Amyloidosis in Western Countries. Kidney Dis (Basel). 2016 Apr. 2 (1):10-9. [Medline]. [Full Text]. Kyle RA, Gertz MA. Primary systemic amyloidosis: clinical and laboratory features in 474 cases. Semin Hematol. 1995 Jan. 32(1):45-59. [Medline]. Leibovitch I, Selva D, Goldberg RA, et al. Periocular and orbital amyloidosis: clinical characteristics, management, and outcome. Ophthalmology. 2006 Sep. 113(9):1657-64. [Medline]. Cross TJ, Wendon JA, Quaglia A, et al. Myeloma associated amyloidosis presenting as subacute liver failure. Postgrad Med J. 2006 Jul. 82(969):e13. [Medline]. Kumar S, Dispenzieri A, Katzmann JA, et al. Serum immunoglobulin free light-chain measurement in primary amyloidosis: prognostic value and correlations with clinical features. Blood. 2010 Dec 9. 116(24):5126-9. [Medline]. [Full Text]. Dispenzieri A, Lacy MQ, Katzmann JA, et al. Absolute values of immunoglobulin free light chains are prognostic in patients with primary systemic amyloidosis undergoing peripheral blood stem cell transplantation. Blood. 2006 Apr 15. 107(8):3378-83. [Medline]. [Full Text]. Porrata LF, Gertz MA, Litzow MR, et al. Early lymphocyte recovery predicts superior survival after autologous hematopoietic stem cell transplantation for patients with primary systemic amyloidosis. Clin Cancer Res. 2005 Feb 1. 11(3):1210-8. [Medline]. [Full Text]. Paiva B, Vídriales MB, Pérez JJ, López-Berges MC, García-Sanz R, Ocio EM, et al. The clinical utility and prognostic value of multiparameter flow cytometry immunophenotyping in light-chain amyloidosis. Blood. 2011 Mar 31. 117(13):3613-6. [Medline]. Chopra A. 125I-Labeled single-chain monoclonal antibody, NS4F5, that targets the GlcNS6S-IdoA2S motif of heparan sulfate proteoglycans for the in vivo imaging of peripheral amyloidosis. 2004. [Medline]. Wall JS, Richey T, Williams A, Stuckey A, Osborne D, Martin E, et al. Comparative analysis of peptide p5 and serum amyloid P component for imaging AA amyloid in mice using dual-isotope SPECT. Mol Imaging Biol. 2012 Aug. 14(4):402-7. [Medline]. [Full Text]. Wall JS, Kennel SJ, Stuckey AC, Long MJ, Townsend DW, Smith GT. Radioimmunodetection of amyloid deposits in patients with AL amyloidosis. Blood. 2010 Sep 30. 116(13):2241-4. [Medline]. Pan WH, Li NP. Clinical pathological feature of early tongue amyloidosis. Chin Med Sci J. 2006 Jun. 21(2):104-6. [Medline]. Zumbo G, Sadeghi-Alavijeh O, Hawkins PN, Fontana M. New and developing therapies for AL amyloidosis. Expert Opin Pharmacother. 2017 Feb. 18 (2):139-149. [Medline]. Kyle RA, Gertz MA, Greipp PR, et al. A trial of three regimens for primary amyloidosis: colchicine alone, melphalan and prednisone, and melphalan, prednisone, and colchicine. N Engl J Med. 1997 Apr 24. 336(17):1202-7. [Medline]. [Full Text]. Gertz MA, Lacy MQ, Lust JA, et al. Prospective randomized trial of melphalan and prednisone versus vincristine, carmustine, melphalan, cyclophosphamide, and prednisone in the treatment of primary systemic amyloidosis. J Clin Oncol. 1999 Jan. 17(1):262-7. [Medline]. [Full Text]. Anderson K, Richardson P, Chanan-Khan A, et al. Single-agent bortezomib in previously untreated multiple myeloma (MM): results of a phase II multicenter study [abstract 7504]. J Clin Oncol. 2006. 24:423s. Dispenzieri A, Zhang L, Fonseca R, et al. Single agent bortezomib is associated with a high response rate in patients with high risk myeloma. A phase II study from the Eastern Cooperative Oncology Group (E2A02) [abstract 3527]. Blood. 2006. 108(11):1006s. [Full Text]. Harousseau JL, Attal M, Leleu X, et al. Bortezomib plus dexamethasone as induction treatment prior to autologous stem cell transplantation in patients with newly diagnosed multiple myeloma: results of an IFM phase II study. Haematologica. 2006 Nov. 91(11):1498-505. [Medline]. [Full Text]. Lenalidomide (Revlimid). U.S. Food & Drug Administration. Available at https://www.fda.gov/Drugs/InformationOnDrugs/ApprovedDrugs/ucm542791.htm. February 22, 2107; Accessed: December 28, 2017. San Miguel J, Weisel K, Moreau P, Lacy M, Song K, Delforge M, et al. Pomalidomide plus low-dose dexamethasone versus high-dose dexamethasone alone for patients with relapsed and refractory multiple myeloma (MM-003): a randomised, open-label, phase 3 trial. Lancet Oncol. 2013 Oct. 14(11):1055-66. [Medline]. Richardson PG1, Siegel DS, Vij R, Hofmeister CC, Baz R, Jagannath S, et al. Pomalidomide alone or in combination with low-dose dexamethasone in relapsed and refractory multiple myeloma: a randomized phase 2 study. Blood. 2014. 123:1826-32. [Full Text]. Gianni L, Bellotti V, Gianni AM, Merlini G. New drug therapy of amyloidoses: resorption of AL-type deposits with 4'-iodo-4'-deoxydoxorubicin. Blood. 1995 Aug 1. 86(3):855-61. [Medline]. [Full Text]. Gertz MA, Lacy MQ, Dispenzieri A, Cheson BD, Barlogie B, Kyle RA, et al. A multicenter phase II trial of 4'-iodo-4'deoxydoxorubicin (IDOX) in primary amyloidosis (AL). Amyloid. 2002 Mar. 9(1):24-30. [Medline]. Tran Thang NN, Abdo G, Martin JB, et al. Percutaneous cementoplasty in multiple myeloma: a valuable adjunct for pain control and ambulation maintenance. Support Care Cancer. 2008 Aug. 16(8):891-6. [Medline]. [Guideline] Dispenzieri A, Buadi F, Kumar SK, et al. Treatment of Immunoglobulin Light Chain Amyloidosis: Mayo Stratification of Myeloma and Risk-Adapted Therapy (mSMART) Consensus Statement. Mayo Clin Proc. 2015 Aug. 90 (8):1054-81. [Medline]. [Full Text]. Apridonidze T, Steingart RM, Comenzo RL, Hoffman J, Goldsmith Y, Bella JN, et al. Clinical and Echocardiographic Correlates of Elevated Troponin in Amyloid Light-Chain Cardiac Amyloidosis. Am J Cardiol. 2012 Jul 5. [Medline]. Nelson LM, Gustafsson F, Gimsing P. Characteristics and Long-Term Outcome of Patients with Systemic Immunoglobulin Light-Chain Amyloidosis. Acta Haematol. 2014 Dec 16. 133(4):336-346. [Medline]. Warsame R, Bang SM, Kumar SK, Gertz MA, Lacy MQ, Buadi F, et al. Outcomes and treatments of patients with immunoglobulin light chain amyloidosis who progress or relapse postautologous stem cell transplant. Eur J Haematol. 2014 Jun. 92(6):485-90. [Medline]. Muchtar E, Gertz MA, Kumar SK, Lacy MQ, Dingli D, Buadi FK, et al. Improved outcomes for newly diagnosed AL amyloidosis between 2000 and 2014: cracking the glass ceiling of early death. Blood. 2017 Apr 13. 129 (15):2111-2119. [Medline]. Dimopoulos MA., Weise K, Song KW, Delforge M, Karlin L, Goldschmidt H, et al. Final Analysis, Cytogenetics, Long-Term Treatment, and Long-Term Survival In MM-003, A Phase 3 Study Comparing Pomalidomide + Low-Dose Dexamethasone (POM + LoDEX) Vs High-Dose Dexamethasone (HiDEX) In Relapsed/Refractory Multiple Myeloma (RRMM). www.myelomabeacon.com. Available at http://www.myelomabeacon.com/resources/mtgs/ash2013/abs/408/. Accessed: May, 18, 2014. Disclosure: Received honoraria from Abbott for speaking and teaching; Received honoraria from Pfizer for none; Received honoraria from Janssen for speaking and teaching; Received honoraria from MSD for speaking and teaching; Received consulting fee from Roche for speaking and teaching.